Do you hate chilly and damp hands? Does the riding season seem too short? National Cycle Hand Deflectors are an economical solution for extending the riding season. Coupled with a windshield, Hand Deflectors protect your entire upper body from cold wind and rain. * Midnight Star has chromed forks but is otherwise the same as the standard Road Star. ** May require adjustment of right control switchbox to provide clearance between throttle cables and Hand Deflector. Do you hate chilly and damp hands? Does the riding season seem too short? 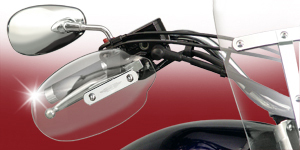 National Cycle Hand Deflectors are an economical solution for extending the riding season. Hand Deflectors are easy to install. 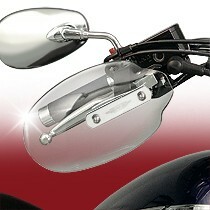 They secure to your bike's mirror mounts, yet allow plenty of room for lever movement and for riders with large gloves. These Hand Deflectors make a windshield function like a fairing. They also make heated grips work more effectively. Hand Deflectors come in two sizes and are application-specific to ensure the correct fit for your bike. Hand Deflectors are manufactured from lightly tinted High-Impact Acrylic. This light tint material blends well with either clear or tinted windshields. Once installed, they'll look lie they were made just for your model bike. Hand Deflectors are designed for bikes with handlebar-mounted mirrors and are secured to the mounting point of your mirrors. Once installed, they are solid and secure. 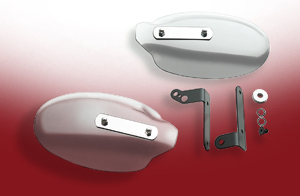 Hand Deflectors are made from High-Impact Acrylic with chromed steel front plates. Steel inner hardware and mounting brackets are painted in low-gloss black. Mirror insert mounting hardware is included.